Medical decisions are made on the basis of critical thinking, and clinical judgments are based on the relevancy of the collected data. Medical decisions and clinical judgments are the results of the long thought process generated from formal learning, data from guidelines and practice standards, experience, an understanding of the incidence of disease in the population that the patient represents, and the likelihood of a disease being present in a specific patient. 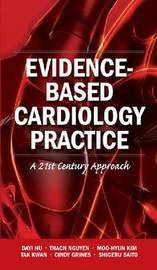 This book introduces and encourages the concept of evidence-based patient care. This work presents the ideology and methodology of critical thinking and also the available evidence, management and cost effectives across the field. Evidence-Based Cardiology is aimed at any clinician who encounters a cardiac patient from the Clerk to the Internist to the Practicing Physician, encouraging disease management decisions to be based on the highest level of evidence.